According to Benjamin Zephaniah the world needs Troublemakers. Are you a troublemaker? I love watching Russell Howard’s Good News for my weekly dose of humour interspersed with positive news stories and an inspiring array of guests. I was delighted to see the legendary poet and self proclaimed ‘troublemaker’ Benjamin Zephaniah as this weeks guest. He is not talking about troublemakers in the sense of a rebel without a cause, but instead of the kind of person willing to stand up against the Status Quo in view of liberating mankind from social injustice. To challenge laws which inhibit equality and to free the shackles of unjust authority. To establish true democracy through peaceful resistance. Benjamin certainly lives up to his troublemaking status. Passionate about inspiring change, the poet works tirelessly with human rights groups, animal rights groups and other political organisations to speak out against injustice. His keen sense of equality is evident throughout his poetry, books and music, through which he advocates social justice and racial equality. If we look back throughout history at all major social movements and revolutions that led to innovative social progress, we will notice a common denominator. They each began with individuals willing to go against the grain of societal conventions and face opposition from the establishment in order to effect social reform and to end injustice in some form. What our world would be like today if people like Mahatma Gandhi, Martin Luther King Jr, Nelson Mandela, Abraham Lincoln, Albert Einstein and The Suffragettes didn’t fight for equality and change the world for the better? Mahatma Gandhi led the Indian people through non violent resistance into independence from the British Colonisation. He also led to ease poverty, women rights, and brotherhood among all religions. Martin Luther King Jr. inspired a movement of non-violence that freed himself and his people from the shackles of racism and segregation. And in doing so, he challenged the moral conscience of all people. Nelson Mandela negotiated the end of apartheid in South Africa bringing peace to a racially divided country. Abraham Lincoln helped abolish slavery in the US. Albert Einstein: challenged dominant scientific paradigms with his theory of relativity, which overthrew the Newtonian paradigm that had been dominant since the Enlightenment. The Suffragettes demonstrated for women’s right to vote, and for equality among sexes and classes in general. Never have those in power willingly and voluntarily effected change, for the power they wield form social inequality is far too great. Instead, real change has only ever began with one or two committed individuals, who inspired a grassroots movement. Take the falling of the Berlin wall, which resulted from a peaceful people’s uprising that began as a small prayer meeting and grew until it toppled an oppressive regime and paved the way for German reunification. The above quote has been a mantra of mine for some time. When I feel overwhelmed by the insurmountable injustices I see in todays world, I seek solace in the reminder that it only takes one person to change the world, just as it only takes one small match to brighten a dark room. It only takes one person to think differently, to think outside the box of established convention and shine their light in the darkest of situations. Life presents us with many reasons to conform; to fit in and be perceived as normal. Everywhere we turn, we are bombarded with cultural conditioning to look a certain way, to adhere to social customs, to achieve a certain status, and possess certain material acquisitions. And society seems to reward those who do. So it takes a certain type of person to go against the grain, to swim upstream and challenge the Status Quo. It takes the ability to think differently from everyone else and to question existing rules, structures and authority. It was Steve Jobbs who’s innovation and creativity inspired me to pursue a creative career all those years back. I was really inspired by his 1997 Apple commercial urging us to ‘Think Different’. It seems to encapsulate all that I have spoken about. 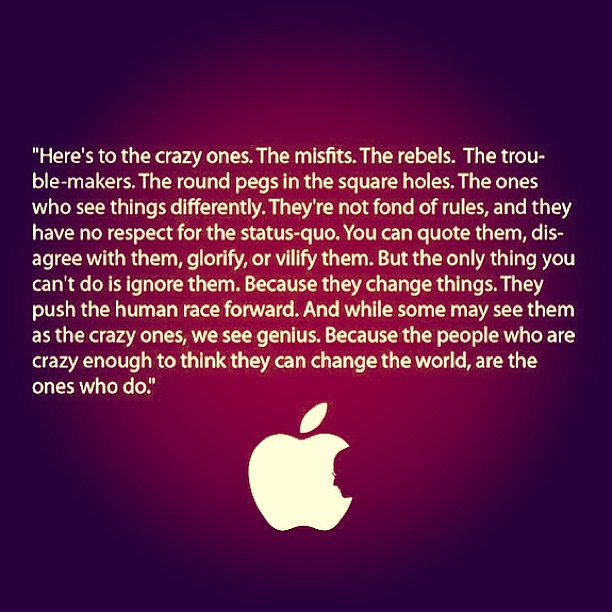 So I dedicate this blog post to all the crazy ones, the troublemakers, the ones who see things differently…..because those of you who are crazy enough to think you can change the world, are the ones who WILL.